This guy. His name is Mike, and he made a post to Slickdeals on December 7th. We used Random.org to generate a random integer between 1 and 190 (we got that many entries), and 75 is the number that came up. Mike, that’s you. Congrats! And Merry Christmas, or Happy Holidays, or whichever non-denominational end-of-year greeting you’d like. We’ll be in touch shortly. For everyone that particiated, thank you. My sincere apologies that we couldn’t get every single one of you something, but don’t worry: we got tons more contests just around the corner, so stay tuned. Oh, and in case anyone is wondering what’s in Mike’s giftbasket, keep on reading. Vaja make some of the most beautiful cases on the market. They’re all handcrafted Italian leather, and are available for almost any gadget out there. Our own Andrew reviewed one right here. Well, the company will be giving away a $100 gift certificate. If you’ve been reading this site for some time, you’re aware of Wicked Lasers. We’ve reviewed their products here and here. They make the most powerful green laser pointers on the market; anywhere from 10 to 50 times more powerful than a traditional red laser pointer. The model being given away is a Nexus, rated at 95mW, and about 20 times stronger than a regular pointer. It’ll burn through paper, cut through electrical tape and has a range of 38 miles. 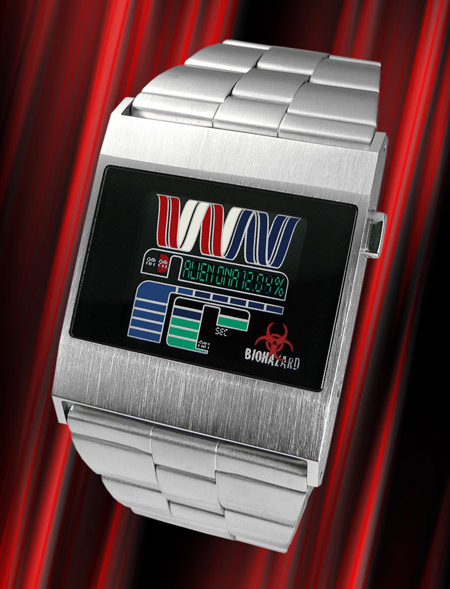 A value of $370. If you’re going to be carrying your gear around, you’re going to need somewhere to put it in. 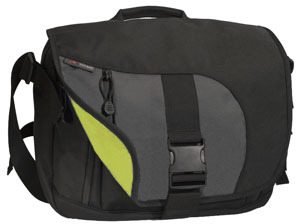 Tom Bihn makes some very nice bags, and they’re giving away their redesigned ID Messenger Bag, along with a Brain Cell or Soft Cell of the winner’s choice, and the Absolute Shoulder Strap and Quick-Adjust Messenger Strap. That’s a $235.00 prize package. If you were around two weeks ago, you know what this is. For those of you first reading this article, the Recorder 2 Plus allows you to digitize any analogue video content, and instantly convert into several formats for playback on mobile devices, be it iPod, PSP, Smartphones, etc. It’s a value of $130. 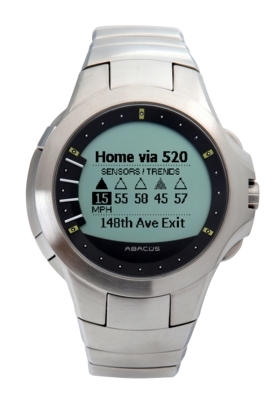 The Abacus Smart Watch is cool for a different reason that the Tokyoflash offering. It syncs with MSN Direct service, and through it you have access to a variety of content, such as the weather, the news, sports scores, traffic, Microsoft? Office Outlook? calendar synchronization*, and even MSN Messenger personal messages*. It comes with a 12 month subscription to the service. Value of $180. 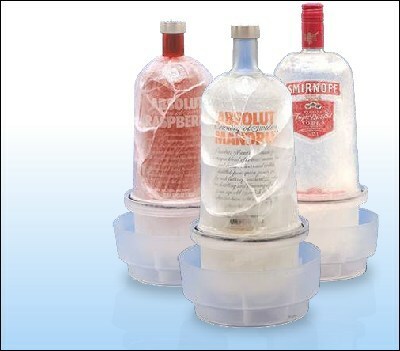 Some time ago, we looked at a device that allowed you to encase your liquor bottles in ice. It was called the Ice Jacket, and was not yet commercialized. Well, the company recently contacted us, and let us know that the product is finally coming together, and should hit the shelves soon. So, one of these is up for grabs as well. That’s a $40 value. It’s not everyone that wastes their entire days reading blogs. Your grandparents for example might waste them watching TV instead. That might be because they’re technologically challenged, but it doesn’t mean that they can’t receive emails. With this HP Printing Mailbox, pre-selected email addresses can send directly to the printer. Your loved ones just have to pick up the paper, and read your email. Presto is giving a printer away, along with three months of service. Value: about $180. The IncipioBud is a cool, $6 gadget that allows you to connect your Shuffle directly to your computer, bypassing the dock altogether. It’s useful, cheap, but doesn’t work without a Shuffle. So, the company is including one! Value: about $100. HEY I know that guy!!! YAYYY THANKS OHGIZMO!!!!! weird.. my comment got cut off. Congrats and thanx to oh gizmo for even giving me a chance to win. Merry X-Mas. good post. i think you ( you as in a cell phone love or owner) will find these other accessories cool, practical, and intresting at the least.